Bring natural light to a basement apartment. EverLast™ Basement Windows and SunHouse™ Window Wells meet building code requirements for a basement bedroom. 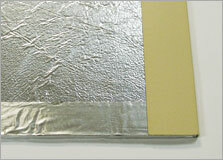 Both products feature durable vinyl construction that never requires maintenance or painting. Remodeling or finishing a basement to create a basement apartment is likely to be the most significant home improvement you could possibly complete on your house. For starters, a basement finishing project expands your home's living space for about half the cost of building an above-ground addition, so it's a very cost-effective improvement. Taking this process a step further to create a separate apartment significantly increases your home's value, while also giving you the opportunity to earn rental income or provide a family member with separate accommodation. Total Basement Finishing is happy to help you transform your basement into a clean, comfortable apartment. Schedule a free estimate with your local dealer today! A house with a walkout basement provides a basement apartment with a separate entrance, which most homeowners appreciate. It's also a code requirement for any bedroom to have an exterior door or an egress window that can provide inhabitants with an escape route in the event of a fire. A full-service basement finishing contractor (a contractor who specializes in basements rather than general home remodeling) will be able to advise you on egress window requirements and suggest the best location for installing an egress window or an exterior door. The good news about remodeling your basement to create a rental apartment is that your maintenance expenses for the rental apartment are completely tax deductible. So you're not just earning rental income; you're also able to deduct the expenses you document for things like cleaning, painting, replacing the water heater, etc. You can even deduct some heating and cooling expenses. Check with your accountant to learn more about the benefits of having a rental apartment. 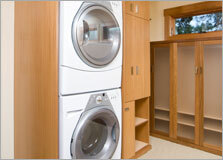 Take advantage of basement finishing expertise. A design consultation is free when you deal with Total Basement Finishing. We'll help you create your dream basement using the best products and technology available. To function as a separate living space, a basement apartment needs its own bathroom and kitchen (or kitchenette). To handle the electrical requirements of this new space, an electrician will probably want to install at least two new circuits at your main service panel –one for lights and one for receptacles. As for the new plumbing, special self-contained basement toilets and compact, high-performance pumps have made it possible to install a basement bathroom without extensive excavation beneath the basement slab. The first step to a finished basement is coming up with a plan for finishing the basement. The next step is finding someone to make it happen. To get the best results when finishing a basement, it's best to hire a contractor who works in basements all the time instead of just occasionally. A basement finishing specialist can handle the wide range of work your job requires –from waterproofing and egress window installation to plumbing, electrical and insulation work. With a full-service basement contractor, you can be sure that the best techniques and materials will be used, creating new living space that's comfortable, attractive, and sure to stay that way for a long time. An apartment with its own washer & dryer will be much more marketable than an apartment without these appliances. To save space, look for compact stacking models. Insulating the basement walls will make the apartment more comfortable and less costly to heat and cool. 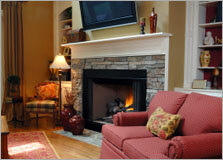 A gas-fired fireplace with an attractive surround can be a cozy focal point in a basement apartment. Sealed-combustion models can vent directly through an exterior wall, eliminating the expense of a chimney. Versatility is valued in any apartment, and a convertible sofa/bed enables your apartment to accommodate visitors from time to time. Also consider a drop-leaf table that can quickly turn a living room into a dining room on special occasions. Renters appreciate generously sized closets and extra storage space because these features make it easier to keep an apartment neat and organized. Computers and cable TV are important. That’s why any basement apartment needs a smart wiring plan. Renters will expect to have Internet access as well as cable or satellite TV. Space wall outlets according to electrical code requirements, and use separate circuits for ceiling lights and receptacles. Ready to get started on your basement apartment ideas? 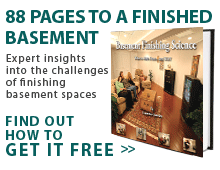 Total Basement Finishing is here to help! Schedule a free estimate and discover how easy it can be to add value and comfort to your home!